Thanks to the opportunities given by esthetic dentistry, we can correct diastemas, chipped or abraded edges, enamel insufficiencies and discolorations without the need for orthodontic treatment. Among the many advantages of veneers are the minimal need for tooth preparation, so we can preserve sound tooth structures. For maximum result, both the dentist and the technician thoroughly prepare and plan the treatment. After preparation, the dentist takes an impression and sends it to the laboratory where it takes up to 4-5 working days to finish the ceramic veneers. 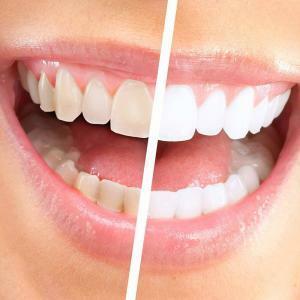 These veneers last up to 10-15 years and are replaceable without any problem. : First we set up a buccal retractor which protects the cheeks and lips. Then a gingival barrier is applied to prevent the bleaching agent from getting in contact with the gums. the substance on the tooth surface. The active molecules neutralize any discoloration resulting from foods, drinks or even tobacco. We re-apply the bleaching material three times altogether to ensure a nice, bright solution and to minimize postoperative sensitivity.